I'm constantly on the lookout for healthy snacks, so when I saw recipes for kale chips online, I knew I had to try making them. After making them a few times, I noticed that kale leaves resemble feather quills. 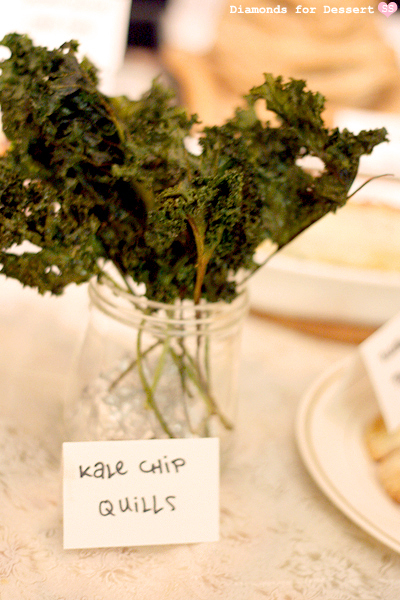 I decided then that I would serve these kale chip "quills" at my Harry Potter party. 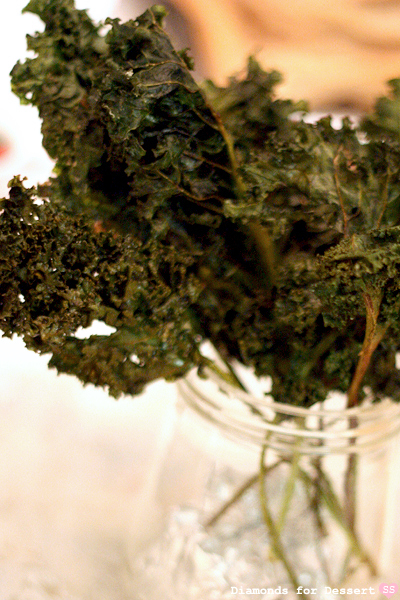 These kale chips are very simple to make, with only three ingredients and minimal preparation. 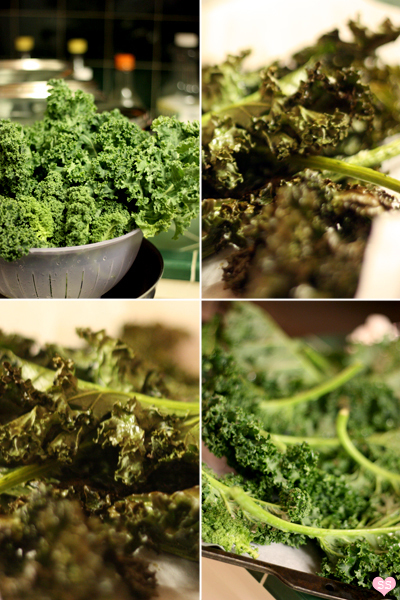 Kale is quite healthful. This leafy green vegetable is loaded with free radical preventing antioxidants and many vitamins and minerals. Also, these chips use heart healthy olive oil, and are baked, not fried. How do these chips taste? They have a crispy crunchy texture and they taste like those packs of roasted, salted seaweed snacks. 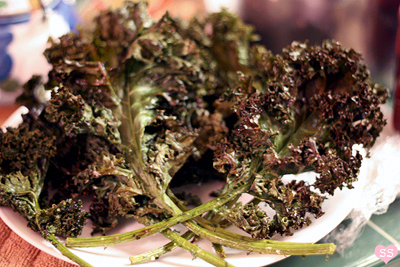 Kale chip quills are a novel and nutritious appetizer, great at any meal. Preheat the oven to 275°F. Line two baking sheets with parchment paper. Rinse and dry the kale leaves. To make them more quill-like, pluck off the smaller leaves on the bottom third of each leaf. 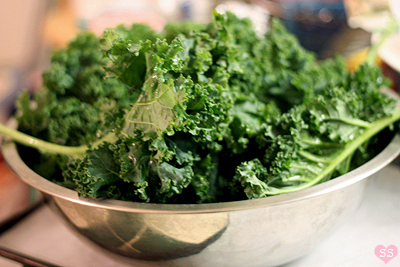 Put the kale leaves in a large bowl. Drizzle with olive oil and toss. Sprinkle with salt and toss again till evenly distributed. Place the leaves in a single layer on each baking sheet. Bake for 30-45 minutes, until all the leaves are crisp and slightly browned, flipping them 2-3 times during the baking. Let cool on a wire rack, then serve. lol those were so delicious, and so easy to make!! This is my favorite way to eat kale, I love the lightness and the crunch. It's so clever that you made them into "quills" for a theme party! I bet it was a great time. Steph: You should definitely try making them sometime. ivorypomegranate: Yup, it's great! A healthy, crunchy snack. And the party was quite fun. Why do they not wilt? I'd love to try some, but all I can think of is them flopping down into a wet mess in my oven. 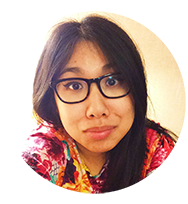 Mousewrites: It does wilt a bit at first, but as it continues baking, the water in the leaves starts evaporating and the kale chips crisp up. Even baking by occasionally turning the leaves helps all of the chips become crispy. Do try them out :).